Gorgeous mild sunny days, light winds, minimal rain and of course two weeks off school - this is a fabulous recipe for a great winter holiday of fishing in a kids mind! Many local school students and visitors to the coast took advantage of the excellent weather for river and beach fishing this school holidays. 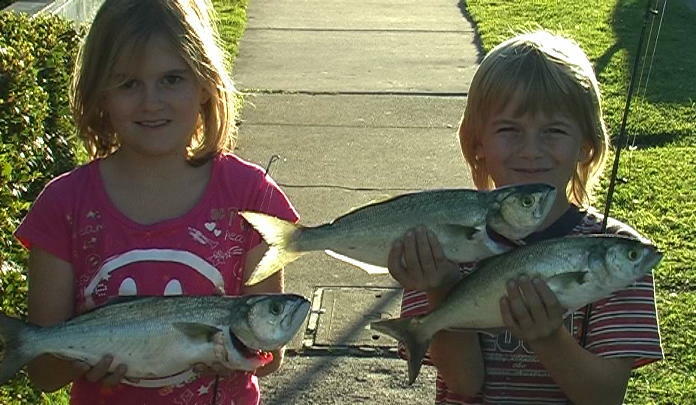 It was promising to see junior anglers and their parents, grandparents, uncles and aunts lining the banks of the Maroochy River. Places like Cod Hole, Cotton Tree and by Muller Park at Bli Bli were all buzzing with action. At one end of the beach there were fluoro coloured junior rods whooshing through the air rapidly like light sabers in ‘Fish Wars: The Phantom Snag', Mums appeared to be secretly dreaming up cloning methods so they could pop down the shops for some RnR while their clone rigged up hooks and sinkers, while the epic battle between young Jedi's and Fath(er) Vader continued over who slayed the biggest Sith lord...errr I mean fish lord. Ah, holidays...I love them because the kids inject so much enthusiasm into fishing; weigh-ins increase as do photos for the rogue's gallery as every single legal catch is brought in to be shown off in the paper! And these holidays have been no different! 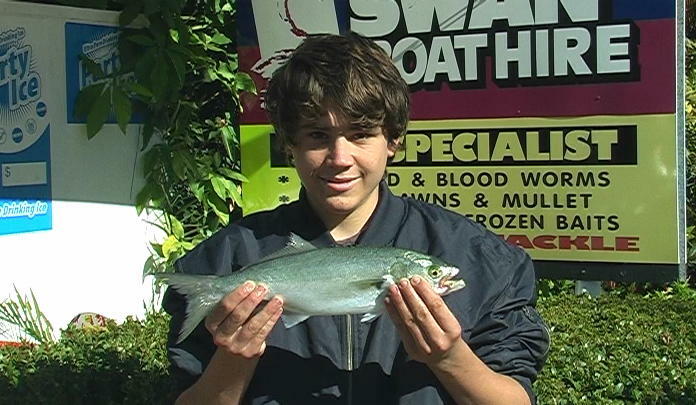 Swan Boat Hire has seen many a junior angler weighing in good quality bream caught on live worm and fresh prawn at the river mouth, off the small jetty at Wharf Street, at Chambers Island, Yinni Street and the Cod Hole. Best fish were weighed in either side of the high tide or early in the day as we open shop. Flathead numbers have been dwindling considering July is the coldest month of the year and the peak of the winter fishing season. Though a few reasonable fish measuring up to 60cm have been caught around Godfrey's Road, Bli Bli Islands and Channel Island on the falling tide. Plenty of junior anglers have had success these holidays with Berkley Powerbait and Gulp soft plastics in the smelt, barbeque and fluoro chicken colourings. Best size for flathead is 5inches with a 1/6 ounce jighead with a 2/0 hook, but the likes of tailor and grunter bream have also hit moving plastics in this size. I can also highly recommend the Tsunami Pro Holographic Swimbaits in 2.5inch glass minnow fleck coloured yabbies. These soft plastics are so realistic and move just like a frightened yabbie scurrying away from a hungry flathead. Big schools of mullet have been gracing all the local beaches between Coolum and Mudjimba and have popped into the rivers for a sticky beak. This is music to the ears of bream and tailor anglers as once the mullet are entering the rivers; the bream and tailor are usually close behind. Tailor have been caught along Mudjimba, Marcoola, Yaroomba and Maroochy beaches at night and as the sun rises. They have also entered the rivers on the high tide and in the Maroochy they have been seen chopping the water up as far as Petrie Creek mouth. Tailor are great fun for the juniors and anglers of all ages as a matter of fact. Nothing is better for giving you a rush than a determined tailor on the line fighting to the bitter end - nothing tastes better than fresh tailor fillets as well, I might add! The cold South-Westerlies have meant that species such as bream have spawned close to the full moon period which has just passed and on June 23rd the winter solstice occurred so we can now expect the days to get longer gradually. This is important if you are the ‘hav-a-fish-after-work' kind of angler. The early sun-down is not conducive to quick trips after work, so the more sun each day will be appreciated. So kids enjoy the last few days of the holidays and try to fit in as much fishing as possible; may the force be with you. Noosa: Today looks like a good day for fishing , but watch the possible Dangerous bar crossings with the forecast swell increases. Good flathead and bream throughout the lower reaches. 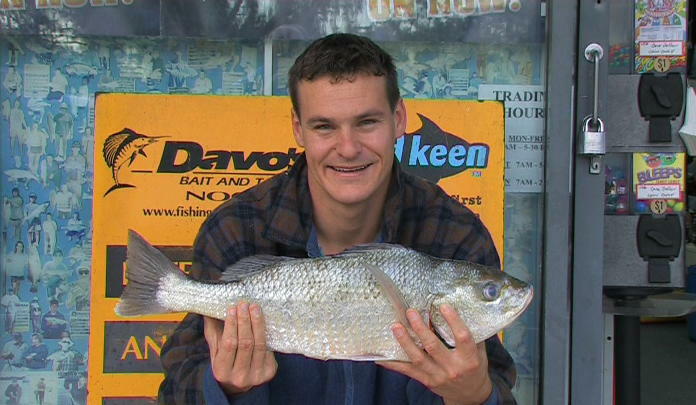 Scattered catches of whiting throughout and trevally and the odd grunter bream in Woods Bay. Maroochydore: Reasonable bream from the Cod Hole, Picnic point, Chambers Island and the river mouth. Flathead to 60cm from the Bli Bli stretch and cotton tree. Trevally around Goat Island the in Twin waters Canal. Kawana: Try for a few tailor, bream, flathead, tarwhine, and some big dart at dawn or dusk along Kawana Beach and off Point Cartwright. Plenty bream in the lower reaches and gar in the sand basin. 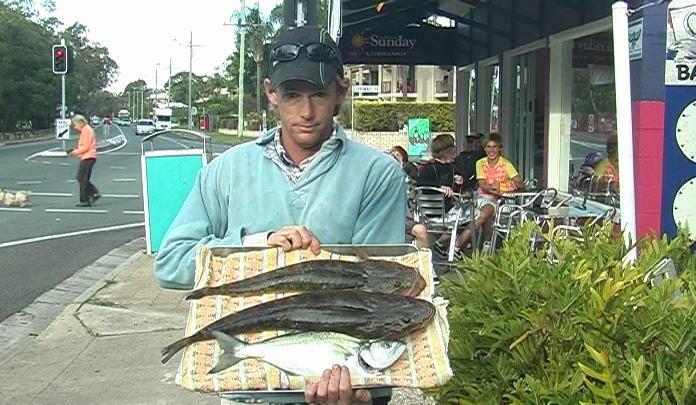 Caloundra: Try for luderick off the boardwalk and trevally in Pelican Waters. Flathead from the mouth of Bells Creek. Flathead and bream in the Blue hole, in the bar and off the military Jetty. Ashlee was enjoying the school holidays fishing with his family from the bank near the motorway bridge pylons with pilchards for this chopper tailor. Ashlee was enjoying the school holidays fishing with his family from the bank near the Motorway bridge pylons with pilchards for this chopper tailor. Peter Batey fished the Maroochy River Cod Hole drifting with 4" soft plastics in the Cod Hole for a chopper tailor and several dusky flathead up to 1.26kg. Cameron and Erin Sullivan fish with their dad from the bank of the Cod Hole on regular basis and hit the jackpot on a recent trip nailing to good tailor using fresh prawns on their small tackle combos.